Allosaurus dinosaur leg bone fossils. Excavated fossils of an Allosaurus femur (thigh bone) and tibia (shin bone). 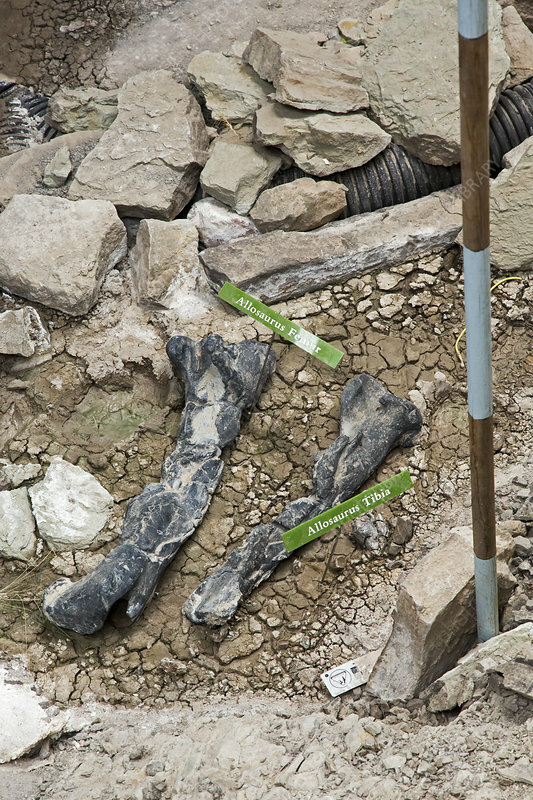 These specimens have been uncovered at the Cleveland-Lloyd Dinosaur Quarry, Cleveland, Utah, USA. More than 12,000 Jurassic-era dinosaur bone fossils have been found at this site, which is part of a geological formation called the San Rafael Swell. The first major excavations at this site took place in the 1920s. It was designated a US National Natural Landmark in 1965. Dinosaur fossils found here include the carnivorous Allosaurus, trapped in a sticky mud deposit, a form of predator trap. Photographed in July 2015.